Hello. I just wanted to mention an incident that occurred last week involving an older lot of Speer Lawman 124-gr. TMJ ammunition. The Part No. is listed on the front of the box as # 3824. On the back of the box, I find "Lewiston ID No. 83501" and in tiny letters "LP-357DX". The above are the closest I can find to possible lot numbers. Nothing is stamped inside the brown cardboard box or on either end flap. The original cardboard case boxes that this stuff came in are long gone. Cartridge cases are marked "Speer 9mm LUGER". Here is a picture of the ammunition being discussed. I bought quite a bit of this ammunition in the the early and mid-90's because I got it at a very nice price and it grouped very nicely in my Browning Hi Powers, several SIG-Sauer P225's and P226's, and a SIG P210. Though not optimum for self-protection, it was very nice range ammunition. Average velocity is about 1140 to 1150 ft/sec from a Hi Power, a bit faster than some other 124-gr. standard pressure commercial 9mm ammunition. I still had a few boxes of this ammunition and used it recently with a Glock 17 (unaltered, except for the sights) and a factory stock S&W M&P. On several ocassions, this ammunition failed to fire despite being stored under ideal conditions (inside the house w/central air and heat). This would occur about 3 times per 10 attempted shots with either pistol. Every round would fire on the second attempt with either gun. A few days later, I took some of this same ammuntion that came in the same case with the "culprit ammo" previously mentioned, and tried it again with the same Glock and some other pistols. I had checked the striker assembly and channel in the Glock 17 and it was both dry and reasonably clean. I did clean it anyway. Examination of the primers on the rounds that failed to fire showed lightly-dimpled striker indentations but these looked normal when fired cases from the second attempts were checked. I am not "knocking" Glocks or M&P's but it appears that their striker-type firing systems do not hit the primer with as much force as pistols having the conventional hammer-and-firing-pin setups, at least not the ones tried above. I seem to recall that some surplus Greek 9mm ammunition having warnings that it was "not recommended" for Glocks a few years ago and for the same reason. I mention this only in case a Glock or S&W shooter decides to buy/use some of this ammunition. I do not know if all lots of this type of Speer ammunition will offer these problems. I have fired Speer Gold Dots through both of my Glocks with no problems at all. Just wanted fellow shooters to be aware of this possibility with this particular ammunition. That's good info to have. In regards to long term storage of ammo, is it possible that over time, the primers become less sensitive? I've have older milsurp ammo not fire on the first attempt from a rifle, even though there was a significant strike on the primer. Hello. 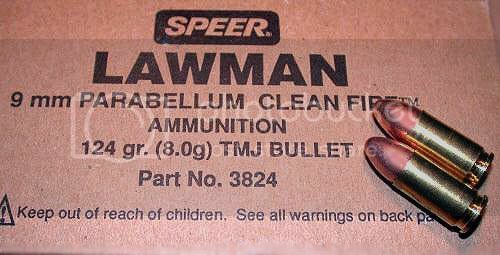 It turns out that this "Clean Fire" version of Speer's Lawman line of ammunition uses a non-toxic primer that is reportedly harder to ignite than CCI's standard primers. do the pencil test. you will find the striker pistols (GLOCKS) hit the primer much softer than hammer fired pistols (e.g. 1911). GLOCKs will often NOT kick the pencil out of the barrel; 1911s will launch it several feet into the air. The Glocks have a heavy weight firing pin spring available. I put one in my G33 right away because I use S&B ammo that has a reputation for hard primers. The spring will increase the weight of the trigger pull slightly. I have never had a failure to fire with S&B ammo in my Glock. If the ammo shoots OK in several guns I would consider it a gun problem(Glock/M&P) not an ammo problem.